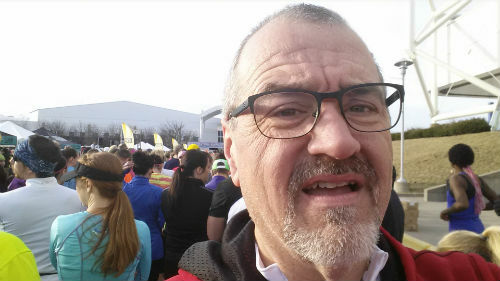 Pointed the wrong way at the starting line of the 2015 Great Plains 10K. Tomorrow morning, just under twenty-four hours from right now, I’ll be crossing the starting line of the Rock the Parkway Half Marathon, my second race at that distance. A year ago, when I ran Hospital Hill, I basically just wanted to finish respectably. This year, I will feel that I have dropped the ball–or perhaps the baton–if I don’t break two hours. Succeed or fail, I’ll report here tomorrow. On my longest training run, thirteen days ago, I did something I rarely do when running outside. I listened to music. Rich Mullins, a favorite of mine for many years, sang a song that I’d never really thought about. Is there a better lyric for a Christian runner? My prayer for tomorrow and for my every endeavor is that the strength in my legs is not my strength and that the legacy of my footprints is not simply my work. I know where my 13.1 miles will end tomorrow, hopefully somewhere before 9:30 am, but I do not know the destination of the truly important race I am running. That doesn’t matter. Tomorrow’s race is more of a ritual, an outward symbol of an inward struggle. I can run as far and as fast as I need to when I’m sharing the road with someone who authored the mercy that will lead and the love that will strengthen me.